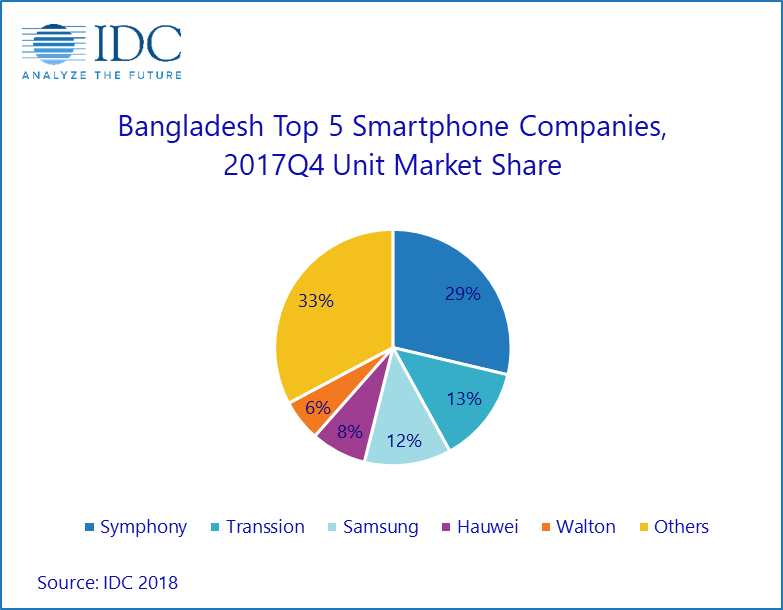 NEW DELHI, 12th March 2018 – The Bangladesh mobile phone market continued its upward trajectory as both feature phone and smartphone categories witnessed a double-digit growth in 2017. According to the latest International Data Corporation (IDC) Quarterly Mobile Phone Tracker, a total of 34.2 million mobile phones were shipped in the country in 2017. The smartphone market recorded a strong 20.6 percent annual growth and ended with 8.1 million shipments in 2017. However, feature phones remained the dominating category with more than two-thirds of the shipments in 2017 and a healthy 14.8 percent annual growth. 2017Q4 recorded lowest smartphone shipments in the last 6 quarters. Natural calamities in the country during the third quarter of the year impacted the sell-out affecting the shipments in 2017Q4. Also, the smartphone companies started streamlining their product portfolio to next-generation technology and focus was to clean the existing inventory from the channels in the last quarter of 2017. All this resulted in a sharp decline of 28 percent quarter-over-quarter and 19 percent year-over-year in 2017Q4. China-based companies continued to strengthen their foothold in the country with a collective share of 33 percent in 2017Q4 from a mere 19 percent in 2016Q4. The local companies started facing heat as their share slipped to 43 percent in 2017Q4 from 64 percent a year ago, though still leading the smartphone segment . High specification product line-up, aggressive pricing and heavy marketing spend helped China-based companies to get a quick share in the Bangladesh market. Symphony continues to lead the smartphone market with 29 percent share in 2017Q4. However, its shipments saw a 48 percent decline year-over-year and 37 percent from the previous quarter in 2017Q4. To counter attack the recent competition from the China-based vendors, it diversified its operations by launching an online exclusive smartphone series “INOVA”. Also, it extended its presence in the lower tier cities with a strong focus in less than US$50 segment.